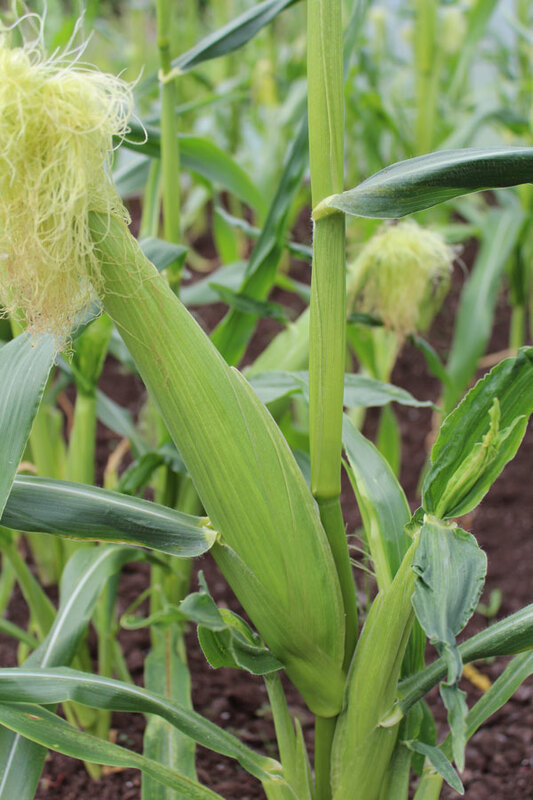 Sweet corn is undoubtedly the most eagerly anticipated crop of the season. But, did you know that corn is not a vegetable? It is actually a grain native to the Americas. Aztecs, Mayan, Inca, and North American tribes cultivated corn (maize) for thousands of years before the Pilgrims arrived. 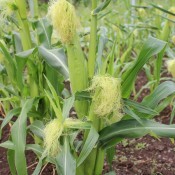 Today, our sweet corn is a mutation of Indian field corn. They are improved hybrid cultivars and are easier to grow. They yield well, taste sweeter, and store longer than old time cultivars. For the home gardener, provide your corn with good growing conditions and you will be rewarded with corn that is both sweet and full of flavour. Plant corn in a square or block pattern rather than in long, thin rows. Corn is wind-pollinated and square planting patterns result in greater pollination. Corn is a great companion plant to beans, cucumbers, melons, peas, and pumpkins. It is not advised to plant corn with tomatoes. Corn is a good source of vitamins A and C, iron, potassium, folic acid, vitamin B6, and minerals. Cooked sweet yellow corn on the cob has about 70 calories per small ear. It is simple to know when to pick a tomato, but knowing when to harvest corn is a little trickier. Examine the silk at the top of the ear; a ripe ear of corn has a small amount of pliant (greenish silk) near the top of the husk, with dry brown silk at the ends. Corn is best picked early in the morning when the sugar content is the highest. Break or twist the shank (stem of the ear) close to the ear without breaking the main stock or tearing the shank from the stalk. It is best to use the sweet corn immediately after picking, or quickly blanch and freeze it. If you must store then, refrigerate with husks on until ready to cook. Truly gourmet sweet corn with its outstanding quality, superb taste and good shelf life. To ensure proper pollination, plant at least 4 plants in a square pattern. Krispy King has excellent cool soil tolerance and benefits from the addition of manure.